Thanks to this cold I can't seem to kick, my mind is a bit of a fog, so please excuse the brevity and boring content. I can't remember when I wore this outfit, but here's some photographic evidence that I did. 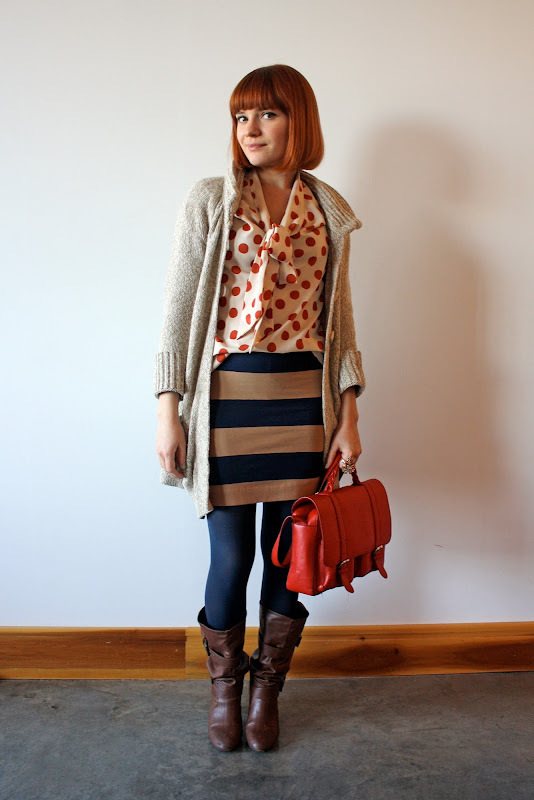 Hooray for polka dots and stripes! Hope you're healthy and happy. Take care! Love this! Dots and stripes are my new favourite thing. Lovely! Dots and stripes together are always a great combination! Love the pattern mixing and the tucked/untucked shirt. Hope you're feeling better real soon! Great outfit! You look so happy! What a great look! Love the mix of prints and colors. Really love this outfit! Pattern mixing has been one of my favorite trends for the past few seasons and I love seeing it done so boldly! 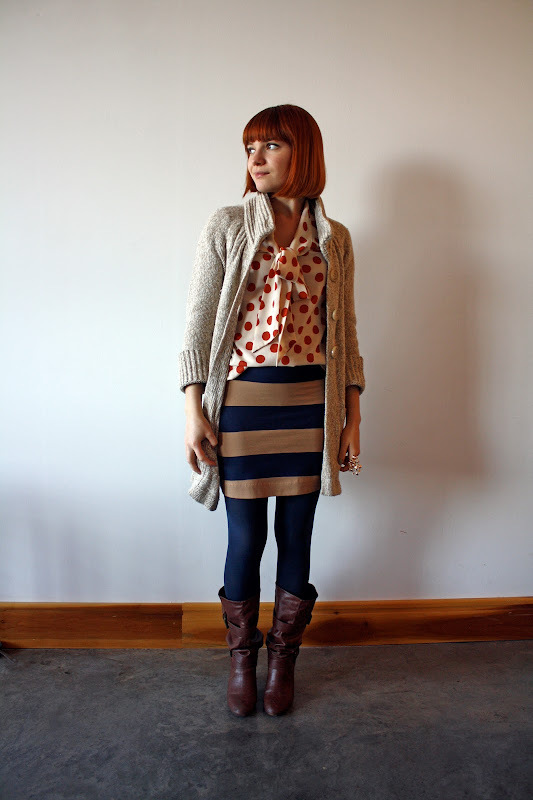 And the bright tights are a great added pop of color. Thanks for sharing! Hooray for cute mixed prints! I love that polka dot top. I know what you mean about feeling foggy from a cold. I pretty much feel like staring at the tv and/or my computer and not really thinking about anything lately. I'm exciting. I am loving the combo of colors, patterns, and textures. You look fabulous! Adorable, as always! Love your mixed prints. Dots and stripes are so much fun to wear. I hope you're feeling better! I need to try stripes and dots. love it!